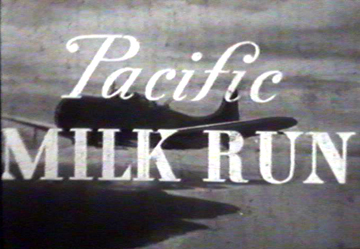 A creatively scripted but blatantly anti-Japanese propaganda film made during WWII about "milk runs" — air combat missions — being carried out to destroy Japanese military bases in Micronesia. Presented in narrative story format, a flyer is writing a letter home, often using slang terms and some military jargon to describe to a friend "Joe" what a milk run is all about. His SBD Dauntless airplane, for example, is called Hot Tamale and he writes, "Hot Tamale sounds good. She's got a voice deep in her throat like Talula Bankhead ... same kind of temperament, too." B-25 Mitchell bombers are referred to as "big jobs" and F4U Corsairs as "Zero butchers." From the narration we learn that the U.S. forces have conquered the Gilbert Islands but have only taken two islands in the Marshall Islands and that there are "easily 100,000" more Japanese soldiers occupying the Caroline Islands. From a map of Micronesia seen in the film the viewer is led to believe that the milk runs in the movie are being conducted from either Majuro or Eniwetok in the Marshall Islands. Shows the day-to-day activites of an American base on an unidentified island and makes good use of air combat domumentary footage. Viewers of the program should be aware. however, that racist slurs such as "Japs" and "Nips" are often used to describe Japanese combants, which was the attitude of many American soldiers towards the enemy at the time and indicative of the historic struggle in the Pacific that was being waged. NOTE: This program is of non-broadcast television quality and generally only suitable for academic or research purposes. It contains scratches and sound distortions which are a function of the used 16mm film from which the video was made.